I've had an Irish car bomb (which is dropping a shot of Jamesons into a glass of Guiness and drinking them together) and I believe that is considered a boilermaker. I've done a shot of Jack Daniels and chased with a beer and I believe that is also a boilermaker. Is there a true definition of what makes a boilermaker in terms of how you drink it? Is the definition only when you drop the shot into the beer or does the definition also include doing a shot and then chasing the shot with a beer? First of all there are two types of boilermakers. A boilermaker can refer to two types of beer cocktail. In American terminology, the drink consists of a glass of beer and a shot of whiskey.1 The beer is either served as a chaser or mixed with the whiskey. 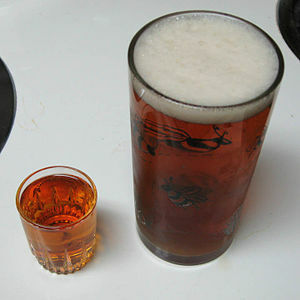 When the beer is served as a chaser, the drink is often called simply a shot and a beer. In Philadelphia, it is commonly referred to as a Citywide Special. In Texas, it is known as a Two-Step. In parts of Florida, it is often referred to as a Git-Right. Apparently there are also two ways to drink a Boilermaker. Neither one is official or wrong. It is up to the individual's choice. There’s a large debate concerning how the boilermaker is supposed to be consumed. While the shot and beer combo might seem straightforward, there are actually several different methods for drinking it, and each one is readily accepted as the best way by those who do it – the only thing that most people agree on is that the shot must be whiskey. The first method is your most basic, and the purists would have you believe it’s the classic: you drink the entire shot and then chase it with the beer. It’s that simple. However, as more high-end cocktail bars have also embraced the boilermaker, and thought more about the pairing of whiskey and beer, drinkers have taken to going back and forth between the two drinks, taking a sip of the shot and then a gulp of the beer, until each drink is finished. The most traditional way to drink a boilermaker is as follows: The liquor is drunk in a single gulp and is then "chased" by the beer, which is sipped. Although no official way of drinking it exists The most traditional way would, in my mind, be more closer to an official manner of drinking it. The ingredients of the American version of a boilermaker: Whiskey and beer. In my lexicon, an Irish car bomb is guinness with a shot of bailey's irish cream and jameson dropped in. Two things to keep in mind with the addition of the irish cream: the cream will curdle quickly with the acidity of the beer, and don't chip your tooth on the shot glass. I foolishly made it once as a sipping drink and it formed a layer of foamy, curdled fat floating on top within 5 or so minutes. Whichever "bomb" drink you choose to enjoy, please be very careful when the shot glass slides forward in the pint glass. I someone break their front tooth clean in half doing that. Much safer to do the shot then drink the beer. Not the answer you're looking for? Browse other questions tagged whiskey beer-cocktails or ask your own question.